What is your ideal Scouting role? If you are new to Scouting or you are looking for a fresh challenge, then use this link to find your role: What's your ideal Scouting role? 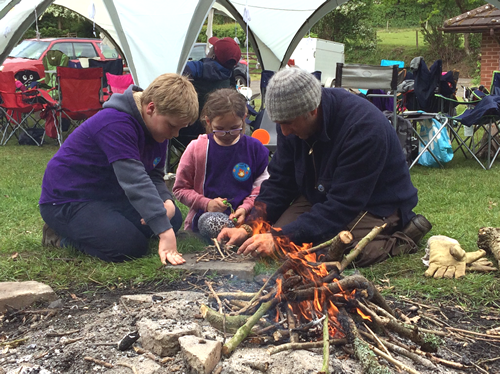 Scouting simply cannot work without adult help and we have vacancies in all areas of adult support. There are three types of adult help in Scouting. Leaders run the Scout sections on a weekly basis, Appointed Helpers assist the Leaders on an occasional basis and Administrators provide support with administration and fund raising. All three types of adult help are needed to provide a full and enjoyable Scouting experience to young people. If you are an adult and you can spare anything from a few hours a month to a few hours a week and you would like to join our adult support team, please contact your local Scout group or use the Scout Association's website. We need your help. The Government recently described volunteering as 'the essential act of citizenship and a powerful means of social inclusion.' Spending time working with and caring for young people is a means of making that vision a reality. Making a voluntary contribution to your community can be a valuable and rewarding experience. More than that, it is an opportunity to help build an inclusive society where the gap is bridged between people of different colour, religion or background. By taking on an adult role in Scouting you will be able to make constructive use of your spare time, share your talents and skills and help improve the lives of young people. Adults often find that becoming an occasional Helper or Supporter is a rewarding way of offering a little of their spare time. The exact function of Helpers and Supporters will vary locally but examples are as wide ranging as making drinks for Beaver Scouts to driving minibuses for Explorer Scouts. Besides all the other roles in Scouting, each Group, District and County will have a team of adults and young people who provide support chiefly with administration, and fund raising. These people take on the roles of Chairperson, Treasurer and Secretary as well as any other role agreed upon locally. Training is available and people who take on these roles find that the training and experience they receive help them in their own personal development. If you are interested in joining the adventure then visit the Scout Association's website to sign up.